The VK 160 and AM SOTA event (1st April 2017) provided the deadline pressure needed to complete this build. The rig is a separate transmitter and receiver, so seeing as there are no shared modules, I shall call it a trans-receiver rather than transceiver. The designs for both transmitter and receiver are by Drew Diamond VK3XU. See Drew’s Projects Volume 3 book for full details, available from the WIA or RSGB. 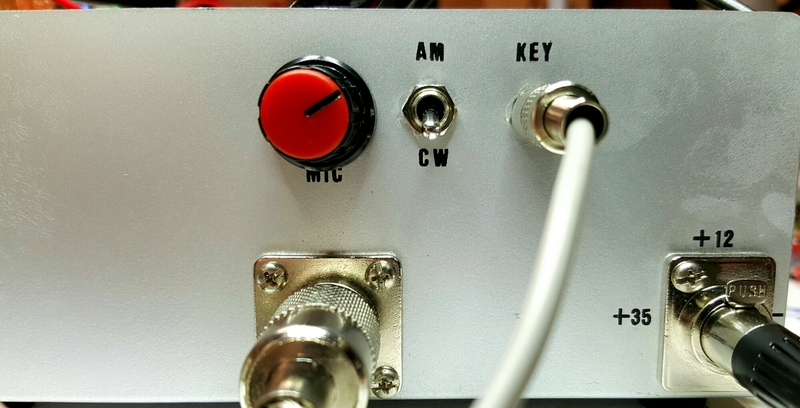 I posted details of the 160m AM receiver when I first built it, a year ago. At that time I also built the transmitter and power supply. I got the transmitter going but blew up the PA FET (BUZ90). During the long wait for replacements, I shelved the build and moved onto something else. Now, thanks to SOTA, it is finished. The receiver is a simple superhet with 470kHz IF. A 1.8MHz band pass filter with molded RF chokes leads to a SA612 mixer oscillator. I used the device’s internal oscillator as varactor tuned VFO. The 10 turn potentiometer spans about 80kHz providing an easy tuning rate on what is a relatively narrow band. What IF selectivity there is is provided by two IF transformers. The AM detector is a MK484 three pin AM receiver chip. Audio amplifier is a TDA7052A. A separate 470kHz BFO with a JFET sits off to the side with a gimmick capacitor placed near the detector. 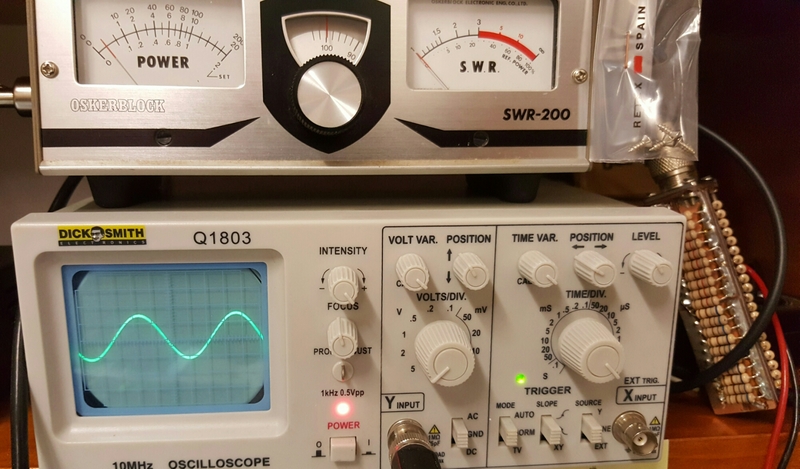 A cheap Chinese counter displays the VFO frequency with the IF offset applied. My approach to construction is outlined here. The transmitter is crystal controlled. I sourced an 1,825 kHz crystal from PK’s Loop Antennas and also included a garden variety 1,843 crystal, with a surface mount Omron relay to select one or other. Interestingly, the output from the former in ‘spot’ mode is noticeably louder than the latter, most likely an indication of crystal quality. The oscillator drives a 74HC04 squarer/driver via a keying circuit to a BUZ90 FET running in class E. Two poles of filtering clean up the raggedy signal on the drain. Drew claims 30 watts of carrier on a 35v rail at 1.5 amps. That is 60% efficiency. I seem to be getting at least that. 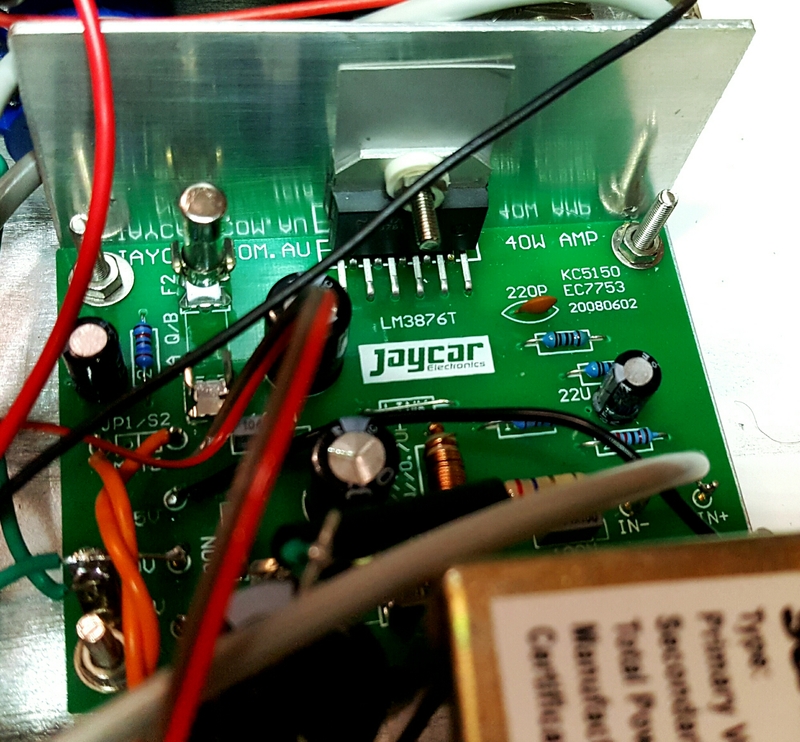 For AM a 50 watt audio module using a LM3876 (Jaycar) drives the 27.5v tap on a 240:30v power transformer. The 240v primary is unused. The microphone amplifier is a 2N5485 and 741 op amp. I mean to replace the (older) op amp with a quieter one once the rig is debugged. The modulator chain has plenty of gain. The front panel has tuning, counter, audio gain, a switch to select one of the 2 crystals, a transmit switch ( no break-in!) and a spot switch which puts 12v on the crystal oscillator so you can zero beat the receiver. I guess a by-product of this arrangement is that you could work split frequency easily! The rear panel has antenna, power (+35, -35, +12), key socket, mode switch and mic gain. I used good quality mini Canons for power, which worked, however the pin spacing is pretty fine. Transmitter testing into a dummy load was performed with PA current (0-5 ammeter), waveform (10MHz CRO) and signal monitoring using the Icom 746Pro base station. The waveform on the CRO in the picture is taken at the antenna socket, set to 50v per division, so about 150v p-p. The trusty Oskerblock shows a bit under 50 watts. PA current was sitting at 1.4 amps on a 33v rail. The 50 watt dummy load was hot after 3 to 4 seconds of key down! The first contacts were from SOTA summit Mt Gordon VK3/ VN-027 on Saturday 1st April 2017, during the VK 160m and AM SOTA challenge. On this day in the southern states VK activators swap convenient bands like 40 and 20m for 160m as well as swapping power-efficient modes like SSB for inefficient but nostalgic ones like AM. It’s all part of the SOTA ethos to continuously create new ways to make activating harder. I wanted to do 160 AM but the need to supply +-35 volts got me in the end (see the discussion here), and I settled for 160m CW only. That did not hamper things at all as the 160m activity I heard was CW or SSB. I made 5 CW QSOs to VK3s and VK2s, including four Summit to summit contacts, with signal strengths in the range S4 to S5. A detailed write-up with videos is here. Both receiver and transmitter worked well. The extra power from the transmitter and the full size quarter wave resonant antenna gave me confidence that if I could hear the other operators, and if I was close to or on their frequency, they would hear me. I enjoyed building his rig. I expect it’s going to get used as a portable mains powered rig in the future, and as a secondary 160m monitor away from the shack. 160m is a good band to homebrew for. Component values are uncritical, LC values are huge, layout less critical and transistors have stacks of gain. 160 or 80m are the only bands I would ever consider using a free running VFO, such as the SA612’s internal oscillator. That said, once you use a DDS, and considering the ease with which you can put together a Nano and si5351 breakout board, or just use the kits from QRP Labs or Ozqrp, it is hard to justify choosing a free running VFO. I started this project a year ago before I had built and experimented with the amazing si5351. If I started this rig today I would use a DDS VFO and display. The class E transmitter was very simple to build and align. I would like to build other CW and AM transmitters in the future, but probably not for 160m. 160m in VK has some challenges. Thirty watts CW is enough for evening interstate contacts (as I proved at Mt Gordon) but not enough for reliable cross town contacts. Compared with Europe or USA, 160 is mostly devoid of activity in the southern Australian states. Of course the 11am Coffee Break net and VK3ASE’s crossbands are 160m institutions in Melbourne, and there are a handful of dedicated CW DX chasers, but apart from those regulars, not much activity. Those CW operators who do appear are mostly running high power and only appear to chase DX. One of the golden rules of home brewing is to do it on a band where you stand a good chance of making contacts. That’s not 160 in my part of the world. But if you have any inkling to build somethink like this don’t let me put you off. The European and US web SDR receivers demonstrate that 160 is jumping with stations in the northern hemisphere most evenings (see the SDR at Hack Green on a 160 contest weekend). So if you are in a populated geography, and you want a 160m project, or if you can join in on a local AM net, something like this might be perfect for you. Let me know in the comments if you are doing anything similar. Drew Diamond VK3XU published a 100 watt Class E AM transmitter for 40m in the Jan/Feb 2017 issue of the Wireless Institute of Australia’s magazine Amateur Radio. He also has a version of the rig for 160 m. This is a better proposition for 16, it uses a bigger (300 watt) linear audio power amplifier module, TC4422 drivers and four W20MN50 power FETs, which takes it to the next level. The FAT5 100W AM transmitter from GW4GTE looks like a good design, free of bulky modulation transformers, and with two options for the modulator (linear, like mine, or PWM), as well as a microphone stage with compression and filtering. Kits and parts are offered.